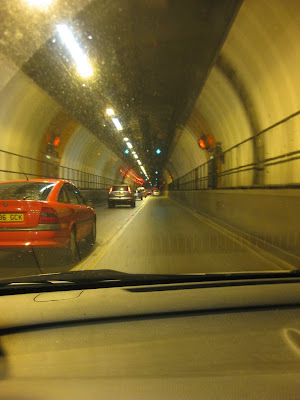 Actually made up of two tunnels, The Blackwall Tunnel links Tower Hamlets and Greenwich along the A102 road. The western tunnel was designed by Sir Alexander Binnie and built by S. Pearson & Sons, and work began in 1892. When the tunnel was officially opened by the Prince of Wales in May 1897, it had cost £1.4 million, and seven workmen had died during construction. To clear the site in Greenwich, around 600 houses were demolished, including, legend has it, one which originally belonged to Sir Walter Raleigh. The second, eastern, tunnel was opened in 1967. It is wider and lacks the sharp turns of the western tunnel, which were reputedly the result of a swerve to avoid a plague burial ground. Its construction involved the building of two distinctive ventilation towers, designed by architect Terry Farrell, which stand in Blackwall. The southern ventilation shafts rise through the Millenium Dome, hence the hole in the roof. 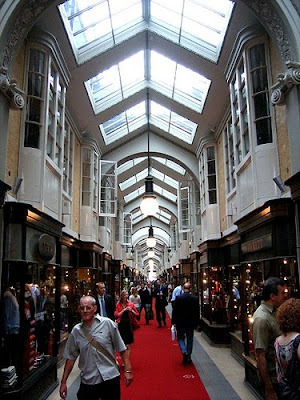 Opened in 1819, Mayfair's Burlington Arcade was Britain’s very first shopping Arcade, and still claims to be the longest covered shopping street in England. 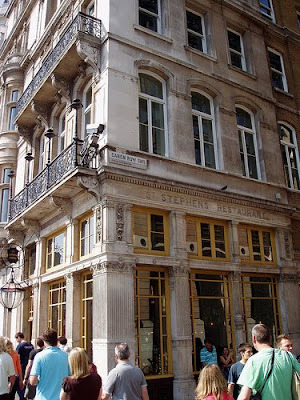 You have to be pretty rich if you want to build a shopping arcade in Mayfair to stop people throwing stuff over your wall, but that's apparently why Lord George Cavendish built the Burlington Arcade, so sick was he with passers-by throwing oyster shells into his garden. The arcade is pretty upmarket, and there is little the likes of your author would realistically want to buy. It is pretty, however, and its smart uniform shop fronts and a glazed roof are given even more charm by the uniformed Burlington Arcade Beadles who patrol the length in top hats and tailcoats, claiming to be the smallest police force in the world. When the arcade opened, the Beadles were hired to ensure that no whistling, singing, playing of musical instruments and running took place. These rules were reputedly to stop thieves and pick-pockets from communicating and fleeing, but the carrying of large parcels, opening of umbrellas or use of babies’ prams in the arcade was also forbidden. 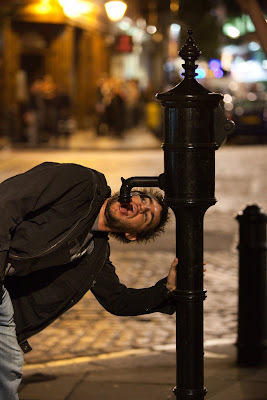 Many readers will be aware of this one, but for anyone who is not, the Broad Street Pump is famous as the source of the 1854 outbreak of cholera in Soho, but this was only ever discovered thanks to the work of one man, Dr John Snow. Residents were stumped as to what was causing the illness and it was only when Dr Snow mapped the addresses of the sick that he noticed that most of those who had been struck by the disease had a unifying characteristic - their nearest accessible water source was the pump located at the junction of Broad Street, now Broadwick Street, and Cambridge Street, now Lexington Street, close to the rear wall of what is now a Sam Smiths pub called the John Snow. Snow subsequently managed to persuade those responsible to take the handle off the pump, and this prevented infected water from being used. Later on, it was discovered that the spring below had been contaminated with sewage. A replica pump has since been installed nearby (see above) to commemorate this. He also managed to use statistics to show the connection between the quality of the source of water and cholera cases, demonstrating that the Southwark and Vauxhall Waterworks Company was using water from a sewage-polluted section of the Thames and delivering it to homes with an increased incidence of cholera. 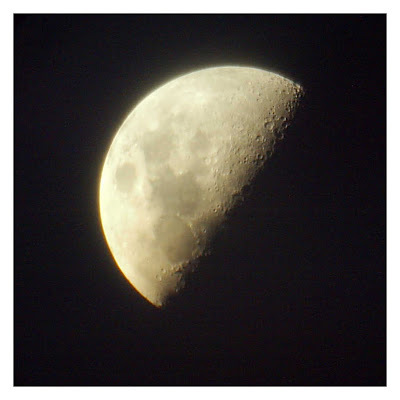 Formed in the early 1970s by Fred Clarke, the brother of acclaimed science fiction author Sir Arthur C. Clarke, and on the recommendation of Sir Patrick Moore, the Astronomical Society of Haringey meets monthly for lectures on a wide range of subject matter covering space research, astronautics, cosmology, science fiction and astronomy. The first lecture was given by Arthur C. Clarke himself, and for many years the Society met and gave exhibitions in and around Alexandra Palace, meeting in the Palace rooms both before and after the fire. The society has since moved to a room at Ashmole School, where they meet for monthly lectures, usually on the third Thursday of the month. There are also occasional observing sessions, with society equipment including an Eight and a Half Inch Dobsonian, a Five Inch Refractor and two Six Inch Fork mounted newtonians, which sound fearsome. It's not a thing that you should aim to ride, but it good to know it's there. The London Air Ambulance is a vital part of the city's infrastructure, carrying out around 1,500 missions a year and providing an invaluable link, to allow patients to be treated quickly without having to sit in an ambulance in traffic. 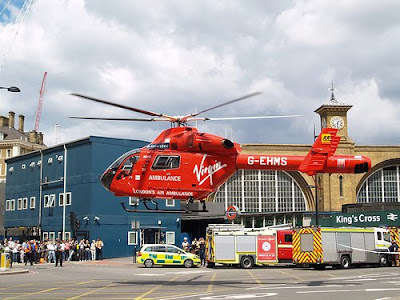 London has had an air ambulance since 1989, and it began working out of Biggin Hill, but moved to The Royal London on Whitechapel Road in 1990, when it was felt a more central base was needed. 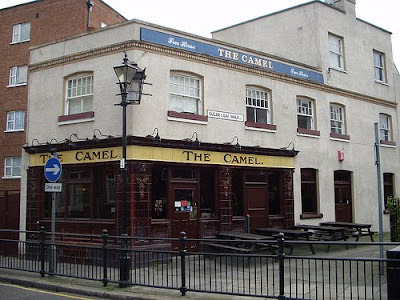 Your author still hears it there almost daily as he pedals down the Whitechapel Road, and often sees it in other areas of London, touching down anywhere it can find space, such as on Euston Road in the picture above. The Ambulance costs £2.25 million a year to run, and is only part-funded by the NHS. The rest of the funding comes from donations to its registered charity, which come from ordinary people and corporate donors, the most conspicuous of which is Virgin, whose logo appears on the side of the helicopter. The deal porters were the labourers in the London's docks who handled imports of softwood timber from North America, also known as "deal". The wood was placed in piles up to 60 feet high in quayside warehouses for storage. As you might imagine, therefore, the handlers needed tremendous physical strength, total cooperation and a head for heights. The trade was very dangerous, and the porters even wore a special leather headgear and "apron" over their shoulders in order to protect their heads and necks from wooden splinters. 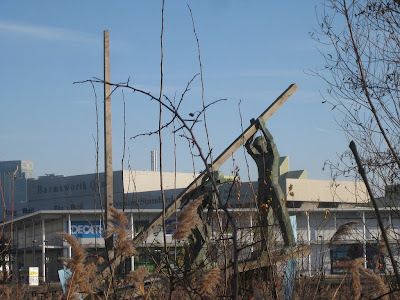 The deal porters are commemorated with a statue beside Canada Water, as a nod to the deal industry which characterised Canada Dock until the 1970s, and the sculpture itself was originally made in softwood before being cast in bronze. Your author felt a bit mean for slating the Insider London Tube Tour a week or two ago on account of its cost, but he stands by his opinions. 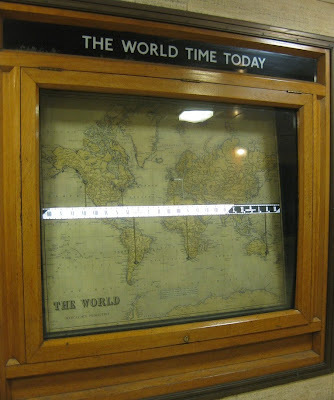 One thing they did introduce him to, however, was the fantastic World Time Today clock at Piccadilly Circus tube station. When architect Charles Holden and builder was John Mowlem & Co refurbished the station at a cost of half-a-million-pounds between 1925 and completed in 1928, the clock was installed as a nod to how the world had changed and how the modern commuter needed such futuristic devices to keep abreast of the situation around the world. The clock features a time band which moves across its central line at the same pace as the earth rotates, and shows the rough time at any point at any time, and whether it is day or night. The only sad thing is that few people notice the clock nowadays in the station's hustle and bustle. As acclaimed London blogger Diamond Geezer observed in 2004, "it's like Piccadilly Circus" round there. 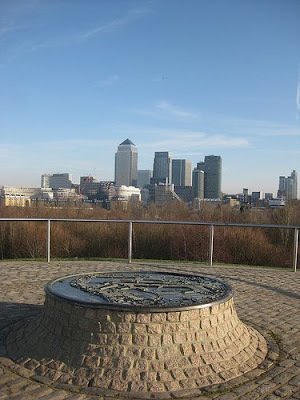 Stave Hill is an artificial mound created in the 1980s overlooking the Russia Dock Woodland, in Rotherhithe, Docklands. The hill is conical and stands 30 foot tall, with steps up one side leading to a viewing platform and a relief map, cast in bronze and designed by Michael Rizzell, showing the former docks which occupied the area. Nearby Russia Dock and Stave Dock, originally key parts of the Surrey Commercial Docks, which were filled in, also in the 1980s, then redeveloped by the London Docklands Development Corporation. 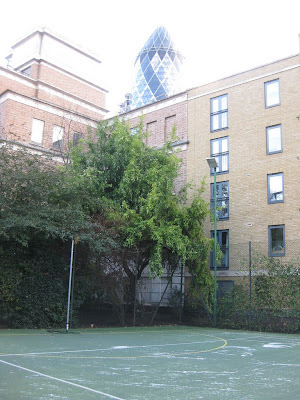 Russia Dock became the site of a woodland and eco park to which your author will return at a later date. The hill provides great views over Canary Wharf, and when your author was there on a crisp Saturday morning just before Christmas they were matched with excellent vistas of the City of London and South London. 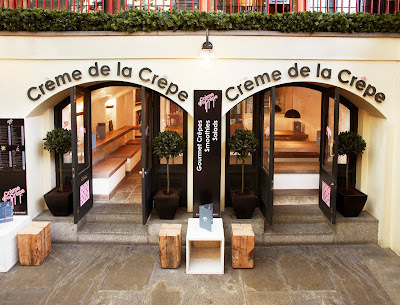 For anyone who wants to get their pancake fix but is looking for something a bit more sedate than the Kindness Offensive's free pancake extravaganza, which kicks off an Ed's Diner this morning, why not pop along to the oddly named Creme de la Crepe in Covent Garden market today. If, like your author, you mostly avoid non-pastie-based shops and cafes in the Covent Garden Market buildings like the touristland plague, you probably wont be aware of this small creperie, which has been operating downstairs in the South-Westerly corner of the piazza since October 2008. 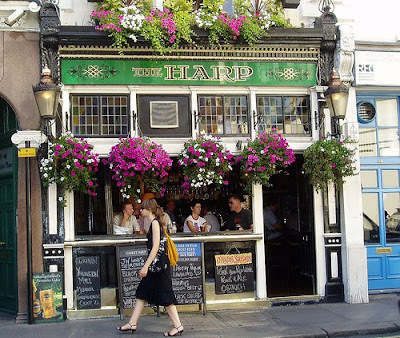 Originally started as a Scotland, on a market stall in St Andrews in 2004, the company has gone from strength to strength, moving to Borough Market in 2007 and opening a proper cafe in Covent Garden the next year. Along the way they've catered fashion shows, appeared on Channel 4 and provided crepes to the American Embassy. 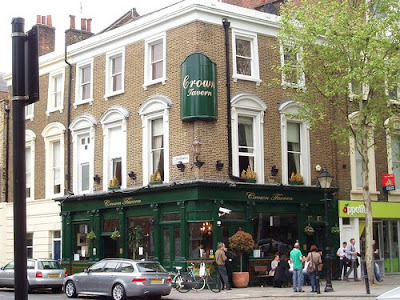 Creme de la Crepe is at 29 The Piazza, Covent Garden (downstairs in the SW corner). 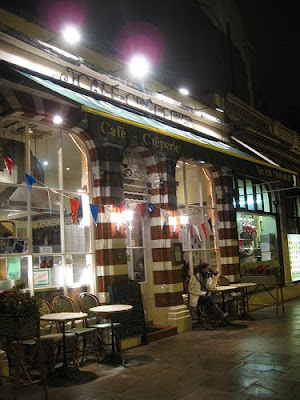 Eat in crepes are between £3.30 and £5.50 and you can find out more at http://www.cremedelacrepe.co.uk/, but turn down the volume to avoid their annoying website soundtrack. The 990,000 square ft Crystal Palace was built in Hyde Park as a place for more than 14,000 exhibitors from around the world to gather and celebrate the progress of the industrial revolution and the might of the empire. The 'Palace', originally designed by Joseph Paxton, who had been gardener at Chatsworth, in Derbyshire, was subsequently relocated to Sydenham, to the area we all now know as Crystal Palace. 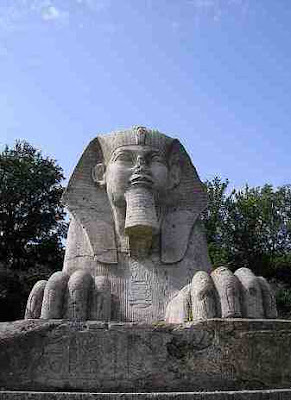 Many of the sculptures and flourishes were relocated with it, and whilst the palace itself burned down in 1936, some of the other elements remain and the Sphinx still stands guard at the entrance, keeping watch to check who accesses the empty terraces where once a palace stood. As mentioned last Sunday, it is time to have a look at the Markfield Beam Engine and Museum, which is open today as part of regular openings on the second Sunday of each month. The engine, in Markfield Park, Harringey was once used to move sewage from Tottenham into the London system for treatment at the Beckton sewage works. 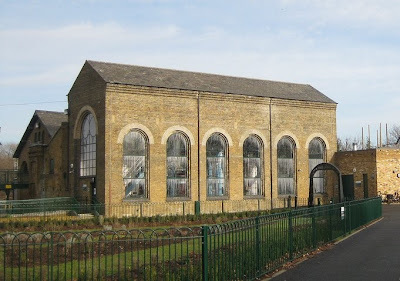 The 100 horsepower beam pumping engine, built in 1886 by Wood Brothers, is housed in an original Grade II listed Engine House in the former sewage treatment works for Tottenham which have now become part of Markfield Park. The Engine operated from 1886 until 1905 continuously, and carried on service on standby operation until 1964 when sewers were diverted to the extended East Middlesex Works at Deephams. The engine has recently been restored and can be seen operating under steam on designated days. 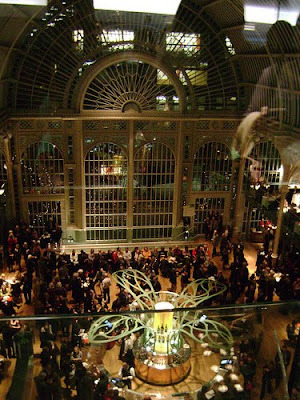 The Royal Opera House in Covent Garden has had a difficult history. 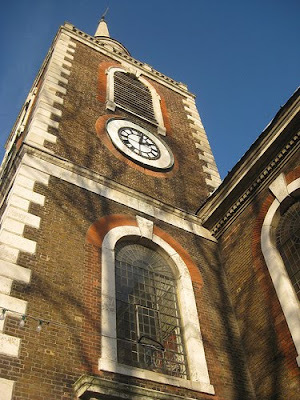 Originally built in 1732, it was subsequently ravaged by fires in 1808 and 1857. Whilst the current Opera House retains the façade, foyer and auditorium of the 1858 rebuild, almost every other element of the present building dates from an extensive refurbishment in the 1990s. The current Opera House auditorium is a Grade 1 listed building seating 2,268 people and has four tiers of boxes and balconies and an amphitheatre gallery. The stage has probably played host to some of the finest names in ballet and opera, whose names escape your author. If you can't face sitting through hours and hours of Opera (or even worse ballet) you can still have a poke around on an official tour. Tours usually Monday to Friday at 10.30am, 12.30pm and 2.30pm, and on Saturdays at 10.30am, 11.30am, 12.30pm and 1.30pm, but this is understandably subject to changes and rehearsals to you should contact them to check. They take about an hour and a half and cost £10. The Chapel of St Peter and St Paul, at the Old Royal Naval College, Greenwich, is opposite Thornhill's famous Painted Hall, and is just as impressive. Originally completed to the designs of Thomas Ripley in 1751, the chapel was gutted by a fire in 1779, and was redesigned and rebuilt under James ‘Athenian’ Stuart, in the ‘Greek revival’ style, with detailing by his Clerk of Works, William Newton. The chapel reopened in 1789, and though it has since undergone changes, a 1950 refurbishment means it stands today almost exactly as it did then. 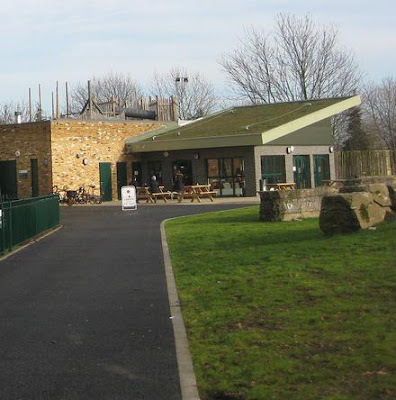 The new cafe in Markfield Park, in Seven Sisters ward, Haringey, opened its doors to the public on Saturday 19th September 2009. The cafe is also known as Pistachios in the Park, as it is run by a franchise with the same name, which runs a number of park cafes and specialises in healthy eating and selling educational wooden toys. The cafe sits in an extension to the Pump House in the park, which stopped working in 1964 and has undergone extensive restoration by the Markfield Beam Engine and Museum Trust who occupy the building and open it to the public every month, but more about that next Sunday. The cafe has free wifi, a free car park and sits on the edge of a 7.6 hectare park by the River Lee with football pitches, a children's playground, a BMX park, a bowling green and a rose garden (in season). The Swiss probably wouldn't like it, and some ridiculous people have been talking about it aggravating racial tensions, but your author thinks the new Minaret, winched into place in mid-December, beside the Brick Lane Jamme Masjid is brilliant. 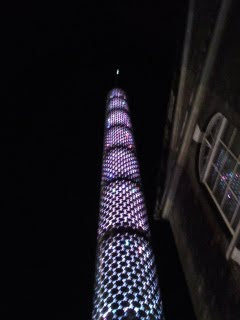 Towering above the corner of Fournier Street and Brick Lane, and topped with a bright crescent moon, the new minaret is 90ft tall, and is right in the heart of the Brick Lane area in every sense. The Mosque itself is a converted former synagogue and Huguenot church, and as such is a symbol of how the area has changed. The Minaret is part of an £8.6m regeneration project which will also see new arches erected along Brick Lane, all paid for with money from the Bishops Square development near Liverpool Street Station. For more, see the East London Advertiser. Sadly, it's a bit beyond your author's means, but if you're looking for a drink at the top of a skyscraper in London, you're in luck. 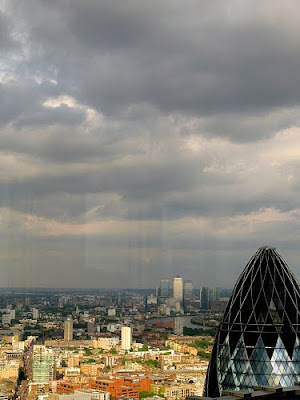 Vertigo 42, the champagne bar on the 42nd floor of Tower 42, is open to anyone who has made a reservation and can stump up the cash. 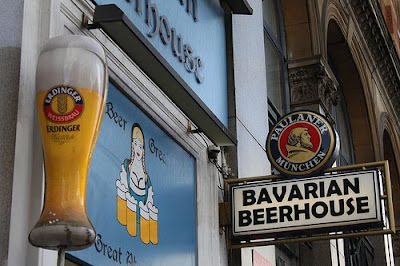 The bar is open Monday to Friday, 12 noon - 3pm and 5pm - 11pm, and Saturdays 5pm - 11pm only. The cheapest drink on the example menu is an £8 a glass wine (175ml and exclusive of 12.5% service charge, of course), but it would be an experience and bottles are from £32. There's also good news if you're looking to host a party. The champagne lounge can be hired exclusively from Monday to Friday, but your author has a feeling it will cost you. 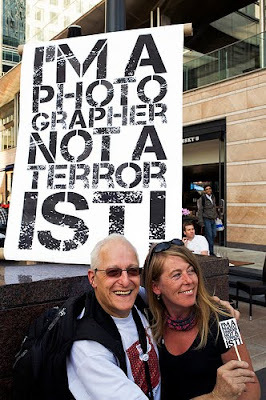 Your author is often behind the curve, so after missing recommending last week's mass gathering in Trafalgar Square, he might suggest you can still find out about the "I’m a Photographer, not a Terrorist" movement tonight at the Frontline Club with co-founder and veteran filmmaker, David Hoffman. Hoffman has been a key campaigner against legislation and police restrictions on photography, and is speaking at the Frontline Club, London's club to promote independent current affairs and journalism, to talk about the campaign in more depth, and reflect on the challenges facing the photography profession, particularly the ready availability of free substitutes for photojournalists’ work . 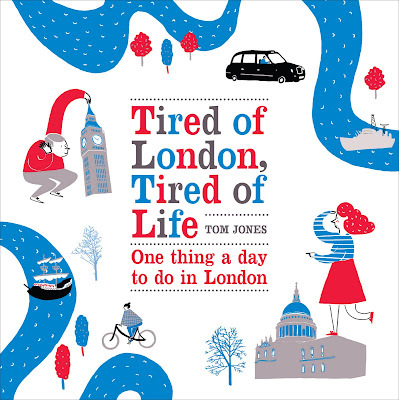 Your author was treated to a free tour on the London Underground recently by the good people at Insider London, and it was very pleasant. 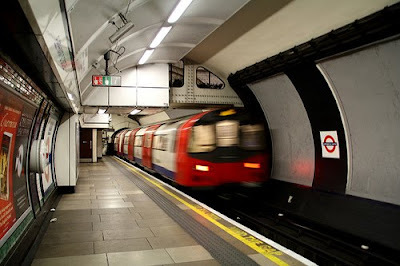 Their two hour tour takes participants through 150 years of tube history, teaching them about various aspects of the construction and development of the world's first underground railway. 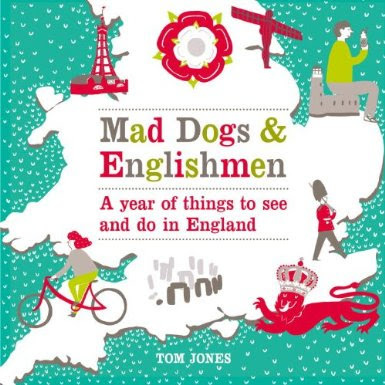 The downside, however, is that at £34.50 the cost is steep and your author isn't sure it is worth that much, even though you do get to learn some interesting titbits along the way, and even get the chance of spotting a 'ghost station' or two along the route. 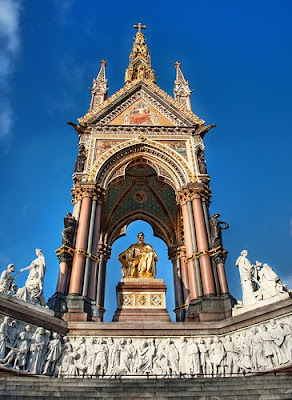 For the money, the tours are also private, held in small groups, and they run whenever you want, beginning at Farringdon and ending at Westminster. For real enthusiasts there is also a six hour option which costs £79.50, and doesn't include lunch because they 'like to let guests choose exactly what they would like'. In truth these tours are both prohibitively priced for anyone but the most ardent cash-rich underground fan, and your author suggests you might be better off buying a book and doing it yourself. 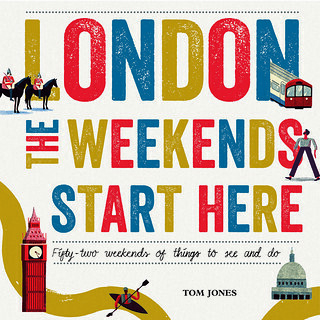 For more on the tour, see http://insider-trends.com/london-underground-tours/ or to book email contact@insider-london.co.uk.